Our boats depart for the island of Chrissi from the port of Ierapetra. The island of Chrissi (or Gaidouronisi) is situated approximately 9 nautical miles south of Ierapetra and it is a Wildlife Refuge. Due to its incredible natural beauty and important ecosystem, it has been included in the European initiative NATURA 2000. Our cruises depart daily from May to October, onboard the following passenger ships:«ARISTOVOULOS», « CHRYSI EXPRESS », « BALOS EXPRESS », « PORTO GRAMVOUSA». Departures from 11.00 am, from the port of Ierapetra. The timetable may change according the season. Please obtain information from our ticket offices regarding the exact times of departure and arrival at the port (Information: +30 28420 20008/ 89988, info@chrysicruises.com). • Passengers up to 2 years old travel for free. • Passengers between the age of 3 and 12 pay 12€. • Passengers over 13 years old pay 25€. The above-mentioned prices (no meals) include 24% VAT, all legal fees, and a written guided tour in your language. The Municipality of Ierapetra collects 1 euro from every ticket (paid in cash), as an administrative fee for passengers over 4 years old visiting the island of Chrissi. By our website www.cretandailycruises.com, by telephone at +30 28420 20008/ 89988 or by email at info@chrysicruises.com, and get your tickets from our ticketing offices on the day of your trip. From all cooperating with our joint venture travel agencies. On the day of your trip you may give us the reservation documents provided by the travel agency and we shall give you your tickets. You can also purchase your ticket from our ticketing offices, without a reservation, on the day of your trip (depending on availability), by paying in cash or with a credit card. The ticket price does not include onboard dining. The self-service bar is open throughout the cruise, offering a wide selection of salads, toast, sandwiches, soft drinks, pastries, pizzas, beers, wine, ice cream, coffee, etc. Before disembarking in Chrissi, you may want to purchase lunch packet, bottled water, soft drinks, snacks, coffee, sandwiches, beach items, etc. from the bar. You may use your credit card for purchases onboard the ship. A hat, sunscreen, and comfortable shoes are essential under high temperatures, especially during the summer months. There is a free parking area at the port of Ierapetra. Our ships in Chrissi and Koufonisi are also ideal for special social events, such as weddings, christenings, etc. (for information please call at +30 28420 20008 in Ierapetra). View the island on google map. 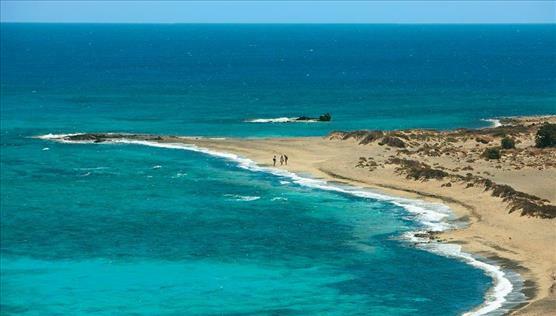 The island of Chrissi (or Gaidouronisi) is situated approximately 9 nautical miles south of Ierapetra. Due to its incredible natural beauty and important ecosystem, it has been included in the European initiative NATURA 2000. It has an area of 4,743 square kilometers, and a maximum altitude of 27 meters. It’s an islet known for its exotic waters in all the shades of blue and green, the golden beaches -where it got its name from-, and the protected forest with the cedar trees, which are over 200 years old. Chrissi is a piece of paradise on earth, the southernmost natural park of Europe, and a gem in the Mediterranean. With soft music playing in the background, we will be sailing in the emerald waters of the Libyan Sea, accompanied by seagulls and dolphins. The trip from the port of Ierapetra to the exotic Chrissi lasts about an hour. The self-service bar of the ship shall remain open throughout the cruise, offering light meals, with salads, wine, soft drinks, coffee, ice creams, etc. We will anchor in the south side of the island, and its only port. The nearby beach is ideal for swimming and relaxation under the umbrellas. 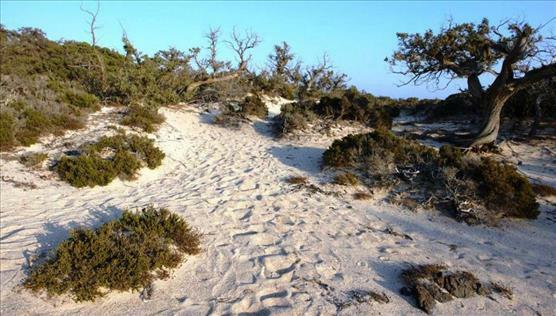 At the point of disembarkation there is a path that goes through the cedar forest and ends up in an exotic beach with thousands of shells, name Belegrina or Chrissi Ammos. The cedar forest extends to the center of Chrissi, covering an area of 350,000 square meters, which is about 1/4th of the island, with an average of 14 trees per 1,000 square meters, and average age of trees 200-300 years. Those trees is a rare variety of Lebanon cedars, 1 meter tall, and with a diameter of up to 1 meter. The cedars have a root system that develops at a radius of at least double their height. Except from their large roots, they also develop a network of thinner ones that form a thick mesh that withholds the sand. The path through the forest and the dunes is simply magical. The colors of the rocks, which are mainly grey-green, reddish-brown, black, etc., are spectacular, while almost the entire island is covered by golden sand. The base rocks of Chrissi were created through the solidification of lava that poured out of an undersea volcano millions of years ago. The 49 species of fossils (corals, shells, barnacles, urchins) found on the island come from the sea. They were imprinted on the volcanic rocks 350,000-70,000 years ago, when Chrissi was still underwater. The northern shores (Belegrina, Hatzivolakas, Kataprosopo) are filled with shells. Especially on the east side of the northern beach, the amount of shells is so big that the view is overwhelming. If you walk west of Belegrina, the next beach you will see is Hatzivolakas. This is a more quiet area, against a rockier landscape, with the beach surrounded by large cedars about 200 years old. West of Hatzivolakas there are traces of a Minoan settlement that prospered from the trade of porphyra, which is the popular red pigment used for dying royal clothes.Recently, the biggest laver farm in the Mediterranean was discovered there. The scenic chapel of Agios Nikolaos and the island’s lighthouse are located right there. On the northeast of the church there is an old salt marsh and the island’s only house, built atop ancient remnants. There are wells and carved tombs on the south and southwest of Agios Nikolaos, with the biggest tomb dating back to the Roman era. Another beautiful pristine beach of the island is Kataprosopo, which faces the Mikronisi islet, on the east of Chrissi, and is a habitat for thousands of birds. The preservation of the island’s natural environment, beyond the moral dimensions, is imposed through a strict national and European institutional protection system. The walk in the forest, the swim in the crystal clear waters, the fresh air, and the ethereal scent of cedars will make your visit to Chrissi an unforgettable experience. Relaxation, serenity, and a sense of tropical adventure! We kindly ask you to be in the ship at least 10 minutes before the departure. Have a nice trip and a great time!